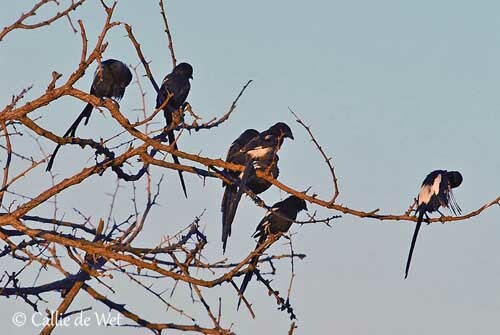 The Magpie Shrike feeds on arthropods, ants, termites, grasshoppers, mantises, millipedes and large grubs. It also takes lizards, mice and fruit and berries. Fresh and rotting meat is also eaten. 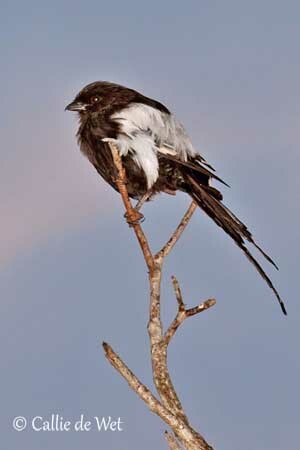 The Magpie Shrike is threatened by changes in habitats modified by humans, and several declines occur in these areas. However, the species is not currently endangered. 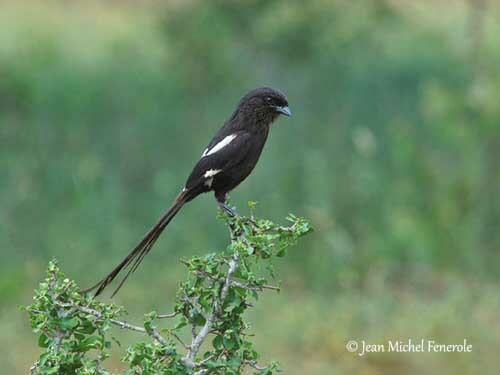 The Magpie Shrike is now placed in the monotypic genus Urolestes. This shrike has very distinctive colour and plumage pattern in comparison with others Laniidae species. 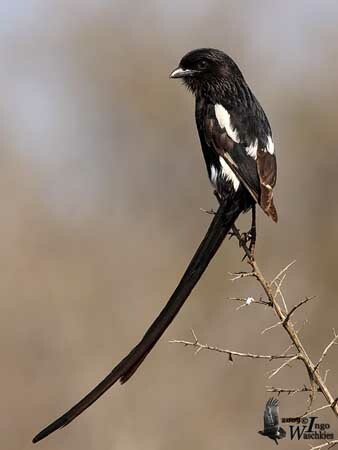 The adult has black and white plumage with very long, graduated tail. Head and mantle are glossy black. The scapulars are white. The rump is V-shaped and greyish-white, conspicuous in flight. On the black upperwing, tertials, secondaries, some primaries and the greater upperwing-coverts are black with white tips. In flight, the white patch near the primary bases is well visible. The long tail is black. On the underparts, chin, throat and breast are black with brownish gloss. Belly and flanks are duller black. Undertail-coverts are black. On the head, the bill is black. The eyes are dark brown. Legs and feet are black. The female is very similar, but she has white patch on flanks. The immature is browner and duller, with rather buffy-white areas than pure white. The underparts are dark brown with white-tipped feathers. We can find four subspecies: aequatorialis, angolensis, melanoleucus and expressa. They differ mainly in tail size, intensity of the glossy black parts of plumage, and variable extent of the white patches. The Magpie Shrike is a noisy bird with wide repertoire of sounds used in complex social behaviour. It utters loud, melancholy whistles “kee-oo, kee-oo” as territorial calls. Several birds sometimes call at the same time. The alarm call is a scolding “chack” or “tchzzrrr”. The breeding pair often calls in duet, “teeloo” by the male, and a higher-pitched “tleeu” by the female. 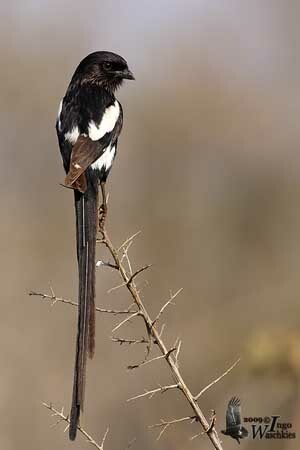 The Magpie Shrike frequents open woodland with scattered acacia trees and savanna-woodland with short grass and bare-ground patches. It may occur in both dry and moist savanna, and dry shrubland. This species is usually seen in lowlands, but sometimes up to 1800 metres of elevation according to the range. 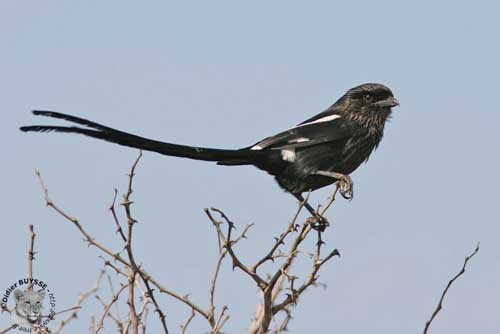 The Magpie Shrike is found in SW Kenya and Tanzania, SW Angola and NE Namibia, S Zambia, Zimbabwe (except SE), Botswana (except most of Kalahari), and N South Africa. The Magpie Shrike is often seen in family groups and sometimes alone. It usually perches on top of the outer branches in thorny vegetation from which it watches for passing preys. It feeds mainly on arthropods and several other insects’ species, but it also takes lizards, mice, some fresh or rotting meat and fruit. It usually hunts from different types of perches, and catches the prey by dropping down onto it. It also may perform a low flight, and plunges on the prey for grasping it. Some preys can be caught while flying. But it also hunts by hopping on the ground, in order to disturb and flush preys, and it gleans from leaves and branches. The Magpie Shrike often performs co-operative breeding, with the breeding pair and some helpers, usually young birds from the previous brood. The male drives away the rivals, but the boundaries of the territory are established with calls and songs. Encounters with intruders may involve some bowing and fluttering displays while the body is held horizontal and the fluttering wings are dropped. 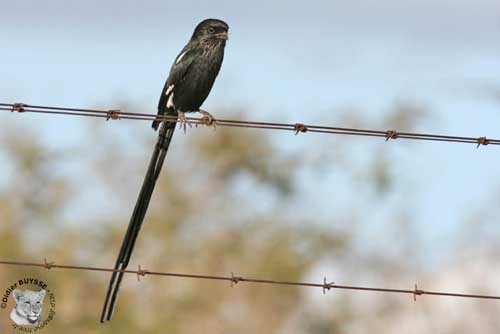 The bird spreads the long tail and lowers the head while the back feathers are fluffed up. These displays are accompanied with harsh calls, and enhance the black and white pattern of the plumage. The courtship displays include courtship feeding by male to female, also a bowing dance and sometimes flight displays. When the female is ready for copulation, she accepts a prey from the male. This is a regular feature of this family. This species is mainly resident but some movements are observed in dry season. The Magpie Shrike has fast and straight flight, but influenced by the long tail and somewhat dipping. The breeding season coincides with the rainy season and varies with the range. 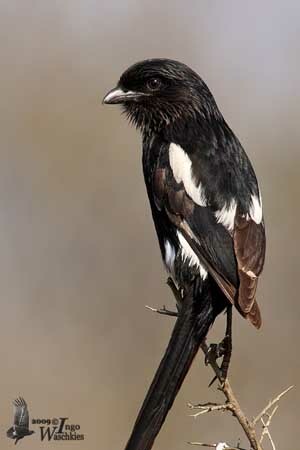 The Magpie Shrike is probably monogamous and a regular co-operative breeder. There are a breeding pair and several helpers, and the breeding female appears to be dominant. Both mates build the nest, a compact cup made with twigs, rootlets, plant fibres and grass, and lined with softer material. It is placed in thorny tree, between 2 and 12 metres above the ground. The size of the territory is about three hectares. The female lays 3-5 buff or yellow eggs with darker spots. The incubation lasts 16-20 days by the breeding female. She is fed by the male, and occasionally by other members of the group. The chicks are fed by both parents and one or more helpers, and then, the young of the first brood feed the chicks of the following clutch. The nestling period lasts between 19 and 24 days, and the young are able to feed themselves during the second week after leaving the nest. But they still depend on adults for up to 8 weeks, during which the parents feed them at decreasing rate. Nest failures are due to nest predation by Corvidae, raptors and monkeys.